Don't units have any special formations / abilities like volley fire for handgunners or schilthrom for spearmen, arrow formation for cavalry etc ? Could that be modded into the game maybe ? this was a disappointment for me too. could it be modded into the game ? I'm on the opposite side on this - I hated micromanaging timed abilities on regular units. Got to the point that you couldn't play without constantly pausing to click whatever 2 or 3 abilities units sometimes had. It think the way they implemented magic in this game is perfect. You have to micromanage one or two units' abilities and that's it. If you had to manage the hero's and every unit had special abilities as well, you might as well turn the battles into turned based as well. Well people really seemed to dislike the abilities-heavy Rome 2 units so they took them out. Personally I wouldn't mind a few unlockable abilities via the tech tree to spice up the rank and file. Under the patronage of Nihil. So there. well i guess that's a matter of taste. I don't think it would be that complex if one could set a spearwall formation for his pikemen or could fire a volley with handguns every now and then. In any case does anyone know if anything like that could be modded into the game ? Formations don't bother me though I think they give players yet another advantage over the AI. I don't like the clickable unit abilities. The Character abilities are enough for Warhammer. STAINLESS STEEL Historical Improvement Project (SSHIP) - v0.8.2 Beta released! To my knowledge formation makes AI computation much more complicated, so either AI simply does not use them or it tries to use them in a very stupid way while the game is massively slowed down. So it's rather wise to choose the lesser evil. Just clicking all of a single character's abilities at the right time is almost too much! One of the best features of the game is how units use passive abilities. Like the trolls who vomit on people without being told to do it. Now bretonnia absolutely needs the "lance" formation, it was in TT as a special way to buff bretonnian knights. I mean it'd be cool if dwarfs had shieldwall, but all formations like that are always used far better by humans than by the AI, so in some ways it makes the game harder for us while also simplifying how many random abilities you have to use. To be honest, I am kind of sick of abilities and miss the good old formations and commands. Here's what I mean: I am kind of sick of abilities that are nothing more that debuffs, I prefer ones that are about what a units does: spear wall, schiltron, wedge, what type of amunition your guys use, this is what I miss. Having halbdiers without pike wall is a letdown for me, or gunners without volley fire(although you research it). In Warhammer, I am really glad they got read of debuff abilities, the Rome 2 or Shogun 2 types but many units simply need abilities like in older titles: I need my spears to hold a shield wall, I need my pikes(well, in this game they are longspears or polearms) to form a wall so I hold the enemy at bay, I need my cavalry to assume wedge, diamond or start circling while shoorting so they don't get hit by missles(something like cantabrian circle) and so on. It adds a whole other dimension to the battle and makes you able to use them in th ways they were meant to. IMO it also makes the battles better since unit strenghts and weaknesses make sense and seem less arcadish/gamey. 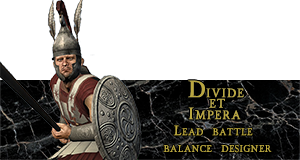 A huge thing that we really need though is to bring the dismount command back, especially on sieges(I can't imagine how it is to defend as Bretonnia) and a land command for air units so you can get them to cover from enemy missles or flying troops. Magic IMO is good as it is, it's one of the few things that can work like the Shogun 2 abilities did, but I think we should have bigger cooldown and slower battles, right now it's like Starcraft II sometimes. Last edited by Aurelius Silvanus Tacitus; May 30, 2016 at 05:44 PM. Yeah, in this title infnatry formations would actually work pretty well since AI is finally capable of flanking and rear charging. That place you go to when the world becomes too much? I'm in the world. I'm why it's too much. Please, for the glory of Sigmar, bring back unit formations. Tight, disciplined formations battling against swarms of rowdy enemies is kind of a huge thing in Warhammer. "Rajadharma! The Duty of Kings. Know you: Kingship is a Trust. The King is the most exalted and conscientious servant of the people." I love lack of of micro. But unit some unit formations like loose formation and should certainly be added. I don`t want every unit to have tons of formations, in middle of battle there is no time to think what is best formation for every situation. There should only be formations with no-brainer purpose, like Schiltrom to prevent spearmen being flanked, pike wall/shield wall depending on weapons and maybe that is it? As for volley fire, why? I prefer current system where soldiers start shooting at earliest possible moment, instead of everyone waiting for 1 guy to reload who is engaged in melee 20 meters away from formation. I get that volley fire is cool and has huge effect on morale, but you could just turn fire at will off and wait until everyone has reloaded, then shoot the enemy. With volley fire or rank fire in past games there have often been issues where enemy charges towards you and nobody shoots at all becouse 1 guy has not reloaded. That is stupid. If issues can be fixed, then sure, add volley or rank fire in. But only if they can be fixed and it does not become micro management hell. And i don`t say micromanagement hell as a bad thing, in some things i like micro hell. But not here. You should never have strategy game where you can win the battle by clicking fastest. To me that has nothing to do with strategy, it is more of "who is least clumsy". TLDR: Formations are fine if they work without issues and battles last much longer. Otherwise, no. Last edited by TheRomanRuler; May 31, 2016 at 07:28 AM. I don't think that microing changed all that much, rather the focus has been shifted elsewhere - instead of using units' abilities we have spells now (and sometimes hero abilities. A lot of them). Being able to use shield formation to better protect units from missiles at cost of speed or to order your pikemen to form a solid stationary line increasing defense/anti cavalry bonus could add more value to the tactical gameplay without generating as much micro. Because how often would you spam units' button? I am really not sure if the trade-off is worth it. If people don't have time to click buttons then slowing down the default speed of the game a bit could give them more real time to issue commands. The game really runs through your "general" now where they can have abilities that allow your infantry to hold the line or do more damage for a short period of time or whatever. There is still plenty of potential for large infantry engagements between armies and certain infantry is better or worse in various situations. Considering how chaotic a lot of the battles can end up being I think this change is probably for the best. I missed the days when archers could deploy wooden stakes, cavalry could form a wedge, and spears can for a phalanx. Would definitely love to see this modded back in. 2016 TW: Warhammer Modding Winner!